6 Reasons Why a Smaller Wedding Can Be the BEST Wedding! Last year, The New York Times published an article entitled “Want a Fabulous Wedding? Consider Eloping”. It’s a great reminder that while there used to be a time when having a small wedding was looked upon as a “poor man’s option”, no longer is that even close to being the case. For all sorts of reasons, opting to elope—or to hold a very intimate ceremony with a few family members and friends—may be one of the best decisions you’ll ever make. The following six reasons will explain why. With the average wedding being a little over $35,000 (feel free to use this wedding calculator to tally up your own charges), the average household debt easily being around $65,000 (if you earned a college degree) and one of the leading causes of divorce being financial issues, already you can see why having a smaller wedding might be a wise route to take. By opting out of having a big wedding—one that comes with a huge price tag—you can enter into your first year as a married couple with more money in the bank. That’s always a good thing. A lot of marriage counselors believe that a huge test of an engaged couple’s ability to communicate and weather the hard times is how they handle the months leading up to their wedding day. Between compromising with plans, navigating between loved ones and all of their opinions and coming up with the money to pay for everything, planning a big wedding day can be stressful, to say the least. But if you have a smaller wedding, not only does that mean you don’t need as much money to pay for it, but you won’t have to spend nearly as much time planning for it either. You can go into your wedding day, calm and relaxed. The two things every wedding day couple should be. There are a lot of couples—couples who actually did have big weddings—who, after five or so years of marriage, look back and have regrets. Not about marrying one another, but about having to go without certain things that they wanted to incorporate into their day but couldn’t, simply because they couldn’t afford it. Unfortunately, some couples’ wedding day was so extravagant—and expensive—they didn’t even get to go on a honeymoon. Then life happened, a couple of years have passed by and they still haven’t. This isn’t something that you have to worry about if you choose to have a smaller wedding. For instance, if you decide to elope at your local courthouse, that may run you no more than $150! Even if you decide to have a destination wedding, you’re going to end up spending a lot less money. With the average honeymoon costing around $5,000, you can have a beautiful wedding and a dream honeymoon, all without breaking the bank in the process. It doesn’t make sense to throw a huge wedding and then cut corners on your wedding reception. 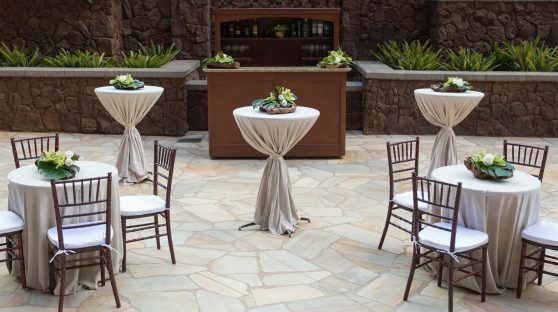 In fact, a big part of the wedding day tab is how much it costs to select a reception venue and caterer ($20,000 total easily). One way you can cut the costs on your reception is to hold your wedding and venue at the same location. Another is to have a small wedding now and host a big party later. That way, you can have an elegant (yet affordable) intimate wedding ceremony, then you can save up enough money to invite all the people you want to a “We’re married now!” party in the months to follow. The final reason why having a smaller wedding might end up being the best idea you’ve ever had is one that we touched on at the top of this article—you’ll be on trend. For the past couple of years, if you look up the popular wedding planning trends, you’re going to see “smaller weddings” on the list. And as you’ve just read, you can see all of the reasons why. So, don’t think of smaller weddings (or eloping) as some sort of consolation. These days, it’s one of the smartest moves couples on a budget could ever make!